One- hundred fourteen members strong and growing, Bristol Eastern’s Friends of Rachel Club (F.O.R. Club) is thriving so far this year. Being a club that started only last year, F.O.R. has reached out to the community and earned their title. F.O.R. 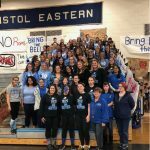 started after a schoolwide assembly at Bristol Eastern High School in memory of Rachel Scott. Rachel was the first victim claimed in the Columbine High School shooting. Spending the short amount of time she had impacting others, she aspired to initiate a chain reaction of kindness. She believed that her efforts of being kind to people would result in them paying it forward. After Rachel’s death, many students reached out to the Scott family and shared stories of her kindness and the impact she had on their lives. Twenty five million people have accepted Rachel’s Challenge. It started as a K-12 program and has expanded to colleges, universities and even businesses who use it as a way of giving back. Their initial priority was student bullying. Over one hundred sixty thousand students across America skip school every day with the fear that they will be bullied. Carrying forth in Rachel’s footsteps. The F.O.R. Club has already participated in multiple charitable events that have included the entirety of the community and has hosted some of their own with the guidance of their devoted club leader, Mary Hyde. Mrs. Hyde puts in countless hours day in and day out to make F.O.R. possible. They started off the year by collecting items such as toiletries and blankets for the victims affected by devastating storms in Texas and Puerto Rico. In October, members of F.O.R. gathered early one Saturday morning with their sponges advertising a free community carwash. Although the club did not charge, they received five hundred forty dollars in generous donations towards their Relay for Life fund. Relay for Life is an annual Bristol event that F.O.R. has embraced that promotes cancer awareness. The F.O.R. 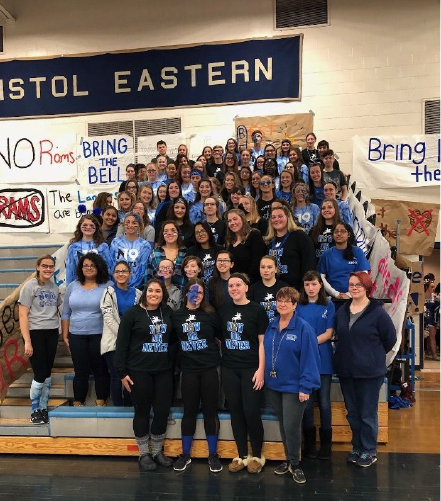 Club participated in a pajama drive hosted by Bristol Eastern, which helped provide pajamas to patients who were/are undergoing treatment at Connecticut Children’s Medical Center and Yale. Knowing that the holidays can be an extremely difficult time for some, Friends of Rachel distributed over two hundred cards amongst members of Bristol Eastern as well as members of the community to spread holiday cheer. They also raised one thousand dollars towards their Relay for Life fund selling Better Than A Bistro desserts for the holidays. Not only can the holiday season be difficult, but the winter as well. Knowing that homeless shelters are filling up and people are trying to stay warm, F.O.R. collected everything from hand warmers to blankets for Brian’s Angels Warming Center. Brian’s Angels works to keep people safe and off the streets during such difficult times. Reaching out to the community is a mission that all F.O.R. clubs and groups around America make a priority. F.O.R. is always encouraging students at Bristol Eastern to get involved and pass on Rachel’s message of starting a chain reaction of kindness. Sabrina Lumbra is a senior at Bristol Eastern High School is on the writing staff of the school newspaper, volunteers her time, Friends of Rachel, that raises funds to fight cancer, and is a member of the Eastern Latin Club. She plans to pursue a career in journalism.